Actually at this very moment I’m not anywhere near the site of the above photo (Halong Bay, Vietnam). I am sitting in my room in the sweetest hotel on the trip so far. Luang Prabang, Laos. It’s been a perfect day in many respects: Elephant rides, a Buddha-residing cave, whiskey village (for 10 minutes—just long enough to take one sip of Lao Rice Wine), a forest-shaped/guided/rimmed waterfall, and in some ways, the best of all, a bear sanctuary. Just telling you now so you’ll look forward to a post to come—because right this minute we are leaving Vietnam with a trip to Halong Bay and the Thien Cung cave. WORKING WITH 2ND AND 3RD GENERATION OR VICTIMS OF AGENT ORANGE. FOR WHICH I ALSO APOLOGIZE. FOR MY OFFICE. THE BOY CANNOT HEAR OR SPEAK. But enough…back for one last look at that amazing brilliant luscious little country that beat our pants off a few years back and seems like it still is in all of the ways that matter. 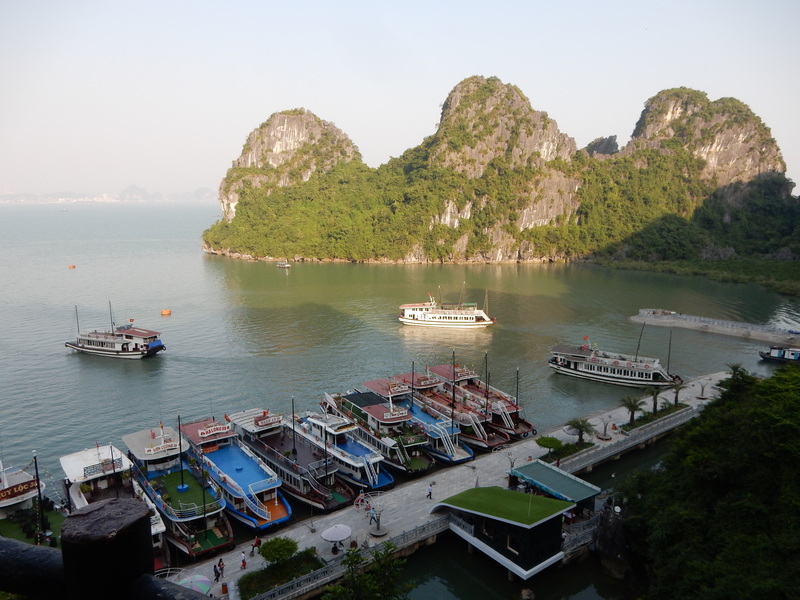 Halong Bay is a breathtaking sight but for some reason the number of other visitors/tourists bothered me here. It’s high season in Southeast Asia and Vietnam is high on everyone’s list so it wasn’t a surprise exactly. I was spoiled by Greenlandic waters and bays last year I think…I wanted peace and quiet and just the lapping of waves (and maybe the creaking of an iceberg or two) as the only sounds! Goodbye Vietnam. We love you. Very beautiful formations trigger very beautiful photos. Thanks.